Distance from the airport to the festival is about 15 minutes. Courtesy of our presenting sponsor, M&T Bank, ATMs are located in several locations around the festival. See the map for exact locations. You may park your bike in racks located in the parking lot of the Rochester Regional Health Big Tent at the corner of Main and Chestnut. Rochester’s East End can be directly accessed from several east side transit routes, including 31 Park, 33 Goodman, 38 East Main, 48 University and 57 East. The East End is a short walk from the RTS Transit Center, where all bus routes stop. Many routes run until midnight or 1AM, making an evening out without the hassle of parking an easy option. Visit myRTS.com for more information and to download the Where’s My Bus? app for real-time bus arrival info on your smartphone from Google Play and the App Store. There may be minor bus route detours due to festival-related street closures; check myRTS.com or call 585-288-1700 for details. E. Main St. between Chestnut St. and Gibbs St.
Food and beverages are also served at the following Club Pass venues. There are also many restaurants in the festival area. Provided by Rochester Regional Health. Located outside the Merchandise Tent on Jazz Street near East Main St. Pick up a free brochure and program guide at any venue during the festival or at the Ticket Shop during the festival. DURING THE FESTIVAL: Please go to the Ticket Office at the corner of 100 East Ave. Open 10 AM - 11 PM daily during the festival. Write your name and cell number on your Club Pass so that you can be notified if lost. Get official posters, apparel, portable seats, and other great gear are available in the Merchandise Tent on Jazz Street (Gibbs St.) during the festival. Limited items also available online. Open 4:00-11: 00 PM daily. RIJF is held in downtown Rochester, NY in the East End Cultural and Entertainment District. All venues are within walking distance of each other so park once and walk to everything. The Festival does not operate any parking but there are many surface lots and ramp parking garages conveniently located near festival venues. Please note, many side streets will be closed. Please read the signs and make sure that parking is allowed wherever you are parking. Many lots are private for the use of their patrons only, so cars will be towed. The Festival cannot take any responsibility for people who park illegally. NYSUT Lot, 30 N. Union Street (corner of Charlotte St.), Rochester, NY 14607. Free, No overnights or WILL be towed. Surface lots, fees vary, all are operated by private owners, the festival does not operate any parking. The use of cameras (still, video, cell phones) and recording devices are strictly prohibited at all indoor concerts at RIJF. Photography is permitted only by credentialed photographers in designated areas. Concertgoers are asked to please abide by these guidelines out of respect for the artists and others in the audience. Anyone not abiding by these rules will be asked to leave the venue. Restrooms are located inside every venue. There are also portable bathrooms outside of the Rochester Regional Health Big Tent, the alley adjacent to Kilbourn Hall, along with the Avangrid/RG&E Barclay Damon Fusion Tent, and on Chestnut Street during the Friday and Saturday concerts. Look for our shuttle bus that is accessible and accommodates two wheelchairs. It will circulate all 9 days of the fest from 3PM–Midnight stopping at key festival venues. Look for shuttle stop signs. Shuttle route loop takes approximately 30 minutes. Sponsored by Harris Beach PLLC. 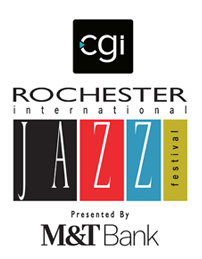 Headliner show and Club Pass tickets if still available – purchase online at rochesterjazz.com, or visit the Jazz Fest Ticket Shop at 100 East Ave open now through June 22 from 10PM–5PM and daily during the fest June 22 - June 30 from 10AM–11PM. Club Shows – enter with the Club Pass or $30/$35 cash only at the door. First-come, first-served for everyone, no reserved seating, no advance sales. Redeem your Club Pass ticket before you attend any shows at Ticket Shop as soon as it is open in June and during the festival or in the Merchandise Tent during the festival. Tickets cannot be redeemed at venues. See tickets for more info. Free Shows – no tickets required, all shows rain or shine. Ticket Shop - located at 100 East Ave Hours before the festival: Dates and times to be announced. Hours during the festival: open June 22 - June 30 from 10am-11pm.